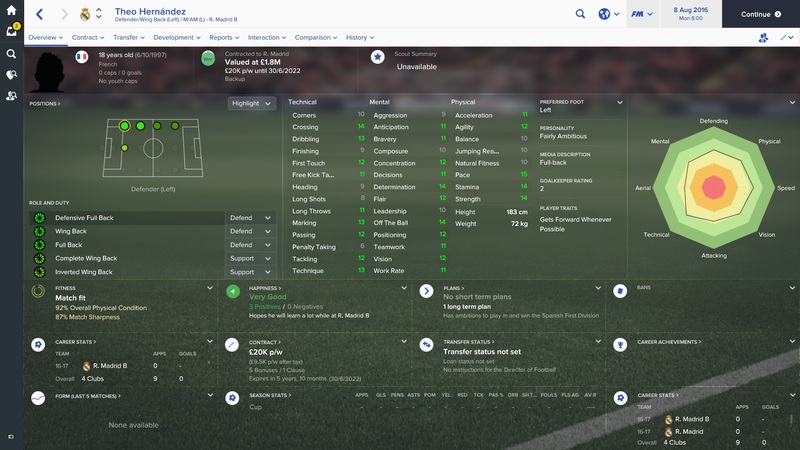 Welcome to 10 Years On, the series where we take a look at some of Football Manager 2017’s best wonderkids and how they have developed ten years in the future. In this post we take a look at Theo Hernandez. In the summer of 2026, Hernandez left Madrid at the end of his contract and signed for Liverpool on a free. He is yet to make an appearance but it could prove to be a very smart move for the wing-back. Despite playing several times for the French youth teams, Hernandez opted to switch his national allegiance, playing for Spain instead. Thanks for reading the latest instalment of our ’10 Years On’ series. Do you have a suggestion for a player to look at? Leave it in the comments section below. And be sure to find us through the various social media links as shown above. You can also follow this blog, meaning that you won’t miss out on any future posts from us. Simply enter your email address in the sidebar (on pc) or below this post (on mobile). This entry was posted in FM Wonderkids: 10 Years On, FM17 Guides, Experiments & Wonderkids, Football Manager 2017 and tagged as roma, fm wonderkids, fm17, football manager, liverpool, real madrid, spain, theo hernandez, villarreal. Bookmark the permalink.